When I told my friend Martha I’d never made a cheesecake, she scoffed. Well, not scoffed. She just didn’t believe me at first, because she knows that I’m the sort to dive into obscure cooking projects at the drop of a hat. 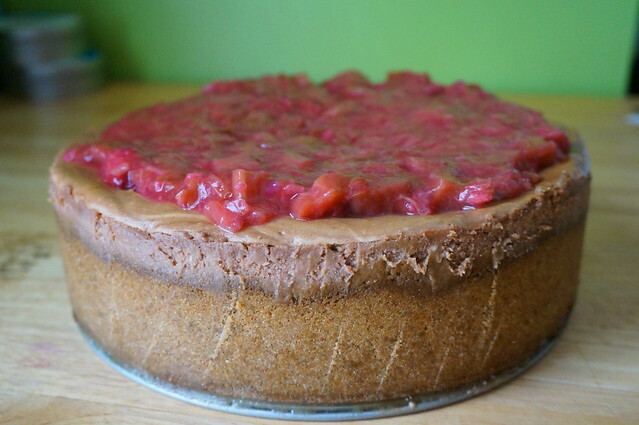 For me not to have made a cheesecake before, not to have made a dessert that’s so common there’s a chain restaurant named after it, really is surprising, especially given that I love cheesecake unabashedly. Somehow though, when confronted with the possibility of making a crust and a seemingly finicky filling, not to mention coming up with some sort of delectable topping… I just couldn’t be bothered. Man, was that ever a mistake. I mean, seriously. Yes: cheesecake takes a bit of effort, but none of the steps is hard — they just take a little time. (And most of that time is chill time in the fridge!) And yes, they’re a little finicky and prone to cracking, but if you do a couple easy failsafes you’ll cut down significantly on that problem. And if you should get a crack or two? Well, that’s where the tasty topping comes in: it doubles as disguise. 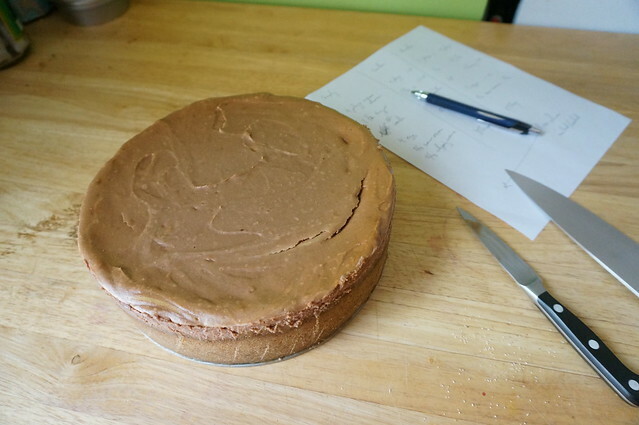 So: how’d I go from never having made a cheesecake to being a cheesecake evangelist? Let’s work our way from the top down. I have some lovely rhubarb growing in my yard (through no domestic magic of my own — it was there when we moved in), and I wanted to do something with it. I love rhubarb’s beautiful rosy color and its refreshing tartness, and I wanted to let both of those qualities shine through. I had visions of a simple compote, cubes of rhubarb glistening in a clear syrup; it sounded so good! But I’ve made compotes before, and the rub is that we don’t eat them. We are not compote people. And so I thought, well, I could make it something to sit on. Like… yogurt? Eh. Or ice cream? Maybe, but it’s been cool around here; not ice cream weather. Or something else creamy… like cheesecake! Ooh, that’s the ticket. 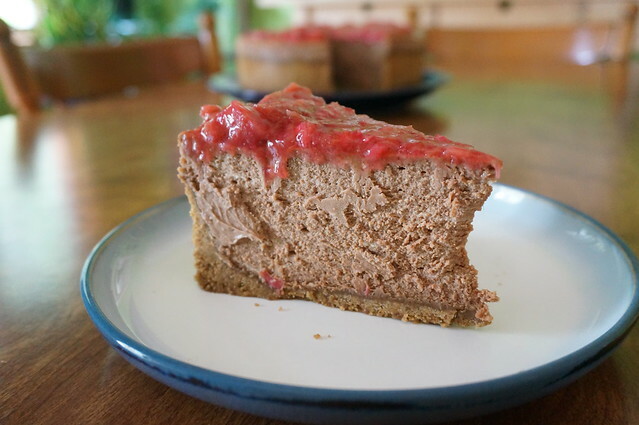 The nice tart rhubarb balanced against the thick creamy cheesecake just sounded perfect, and once a reference source mentioned how easy it would be to make it a chocolate cheesecake, there was no doubt. From there it was just a matter of figuring out the crust, and an unopened bag of gingersnaps on the counter led me to the final piece of the puzzle. The gingery cookies in the crust (all the way up the side, thank you; no sense going halfway) play against the fresh ginger in the topping, and the chocolate and fruit taste like they’re made for one another. Don’t be like me: don’t go decades without making cheesecake. When it can be this good, there’s no reason to wait. Sweet-tart rhubarb and snappy fresh ginger. Crisp, buttery gingersnap crumbs. Cool, thick chocolate sandwiched between the two. Yes, it’s probably a two-day project, but the reward at the end is all the better for dreaming about it overnight. Not gonna lie: this is a bit of a doozy, and requires some pre-planning. If you’re very industrious, you could start work in the early morning, let the cake chill throughout the day, and then serve it at dinner. 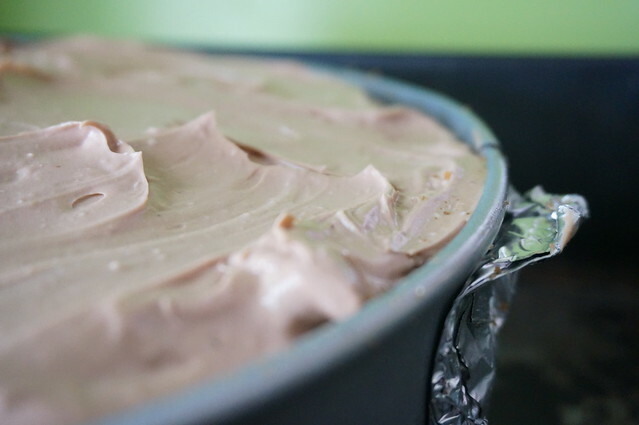 Most people will want to let the cheesecake chill overnight, though, so plan for that. Combine the sugar and ginger with the 2 Tbsp water in a medium saucepan over medium-high heat. Stir to dissolve sugar, bring to a boil and immediately reduce to very low heat. Add rhubarb and simmer, covered, for ten minutes, stirring occasionally and very gently. 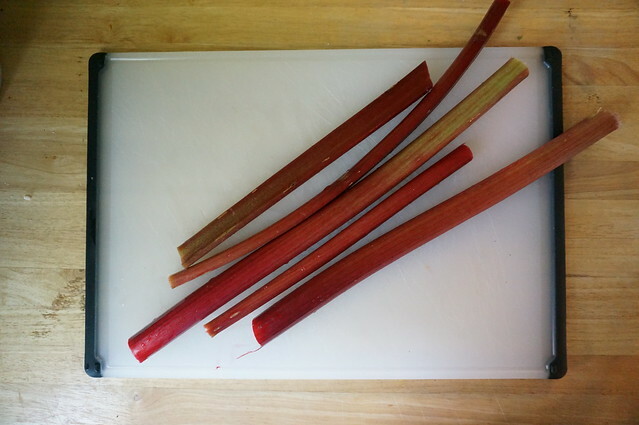 Remove rhubarb with a slotted spoon, being careful not to break up the rhubarb. Combine the cornstarch and 2 tsp water and add the slurry to the syrup. Increase the heat to medium and stir until syrup thickens and becomes clear. Remove from heat and return rhubarb to syrup, folding it in gently. Let cool, and chill until ready to top the cheesecake. 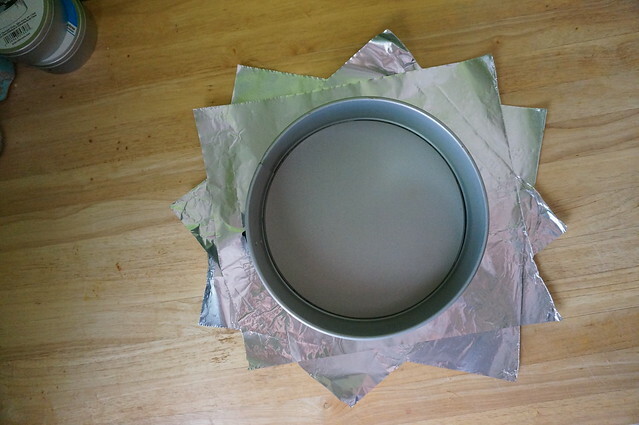 Lay out three squares of heavy-duty foil (18″ or so), and place a 9″ springform pan in the center of the squares. Fold up the foil around the pan to make it watertight. Process gingersnaps in food processor till completely powdered: you should have approximately 3 cups of crumbs. Mix the crumbs with sugar and melted butter until they are thoroughly combined. Press the buttery crumbs into the foil-wrapped pan to create an even layer covering the sides and bottom. It’s often easiest to press in the sides first, then the bottom. Press in the crust all the way to the top of the pan. Bake for 10 minutes to set the crust, then remove and set aside to cool. Reduce oven temperature to 325°F. If your chocolate is in bar form, chop roughly. In a microwave safe bowl, microwave the chocolate in 30-second bursts, stirring between each burst, until it is melted. Stir in the espresso powder, if using, and set aside. 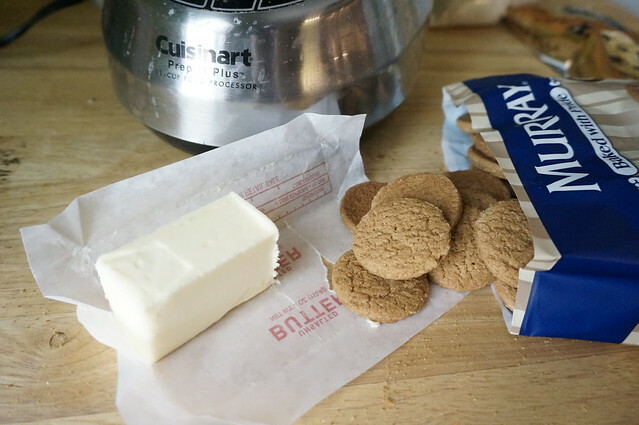 Cut the cream cheese into chunks and combine with sugar in a stand mixer. Beat at low to medium speed until combined. Add the vanilla and the eggs, one at a time, beating between additions, to incorporate them fully. Also between additions (with the mixer off), run a rubber spatula around the edge of the bowl and under the beaters to ensure that there is no unincorporated cream cheese. 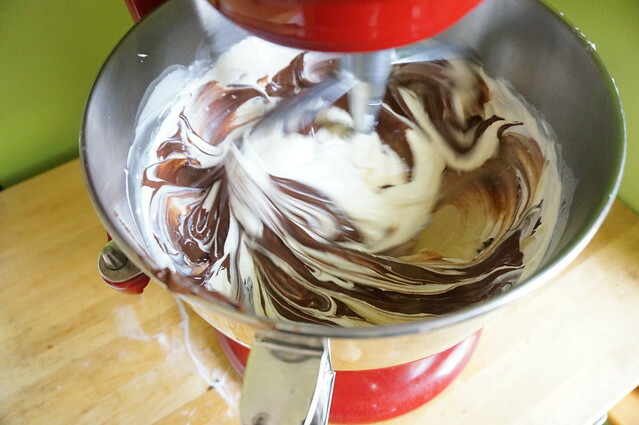 Add the sour cream, then the heavy cream, then the melted chocolate, beating well between each addition. As above, use a rubber spatula to make sure the entire mixture is evenly combined. Scrape/pour the filling into the prepared springform pan and smooth it out, disturbing the crust as little as possible. Place the filled springform pan into a deep roasting pan and pour in approximately 2 quarts of boiling water, enough to come halfway up the side of the pan without overtopping the foil lining. Bake the cheesecake in its water bath at 325°F for 90 minutes. Turn off the oven and prop the door open by about an inch with a wooden spoon. Let the cheesecake cool slowly in the oven for an hour, then remove from the water bath and let cool completely. Chill thoroughly in the refrigerator (at least four hours), with foil covering but not touching the the cheesecake. To serve, run a sharp knife around the edge of the pan to release any stuck crust, then open and remove the ring. Top with with the gingered rhubarb and take a moment to congratulate yourself before serving. Store leftovers in the fridge, just as you did the untopped cake. This is at least a two-day process, what with the chilling. 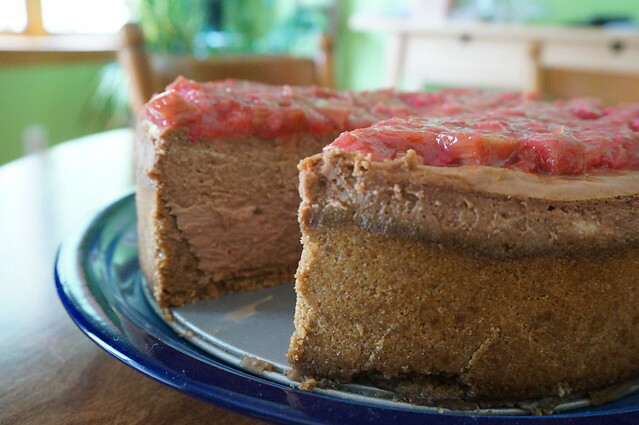 If you’d like to stretch it out even more, the rhubarb topping will keep for a good week in the fridge. The only adverse effect will be on its gloss: the longer it sits, the less clear and glossy it will be. Still delicious, though. You could also theoretically blind-bake the crust separately from the filling, but given that it’s only a ten-minute bake and you’re heating the oven anyway, I wouldn’t necessarily bother. Really the best way to get the filling smooth would be to mix it in a food processor. That would take a really big work bowl, though; even my 11-cup processor is too small. As a compromise, you might combine the cream cheese, sugar, eggs, and vanilla in the food processor (all at once), and then transfer to a stand mixer to continue. Getting the cream cheese mixture smooth is half the battle, so you’ll be well on your way. On the other hand, you could do this all by hand, of course: crush the gingersnaps in a plastic bag with a rolling pin, melt the chocolate over a double boiler, cream and mix the filling ingredients with a wooden spoon and a lot of elbow grease. As long as you’re thorough, you should have equally good results. I’m far too lazy, I’ll admit, but I commend you for it!